A dreamer. Gaming for 469 Euro ( $620)? No, we are not testing an Xbox bundle. It is a 17-inch Office laptop featuring an entry-level graphics unit. Will gaming ambitions be curtailed by the Pentium processor? The details can be found in this review. Samsung NP-300E7A-S09DE: Big screen Office with gaming ambitions? 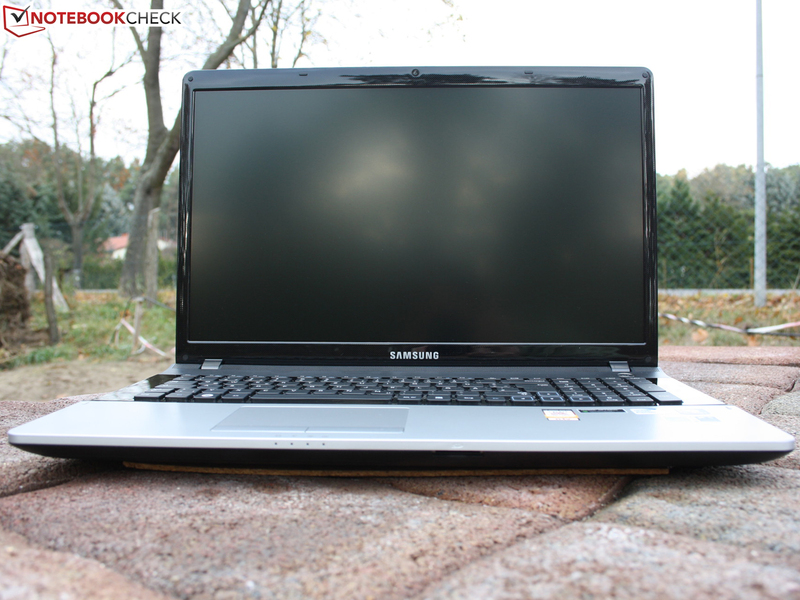 Samsung has an enormous diversity of laptops on the market. Innumerable devices are found in the series two to nine and only differ by a few digits in the product name. Today, we are presenting a 17-inch laptop from the Series 3 line. The 300E7A is low-cost at its best: a simple plastic chassis, a weak Pentium processor and a matte, run-of-the-mill screen. However, the dedicated graphics card in the 300E7A lets it break out of the Office world. Nvidia's GeForce GT 520MX is controlled by Optimus, which allows turning it off in favor of battery life when needed. Everyone who is on a tight budget but does not want to waive on games perk up when a dedicated graphics card is mentioned at this price. Samsung's 300E7A is available for 399 Euros ($525) in the test configuration without Windows (Free DOS) (and possibly sold out). Will the Pentium 950 be in line with your gaming ambitions? Are there similarly competitive laptops that offer more performance or are better in other areas? 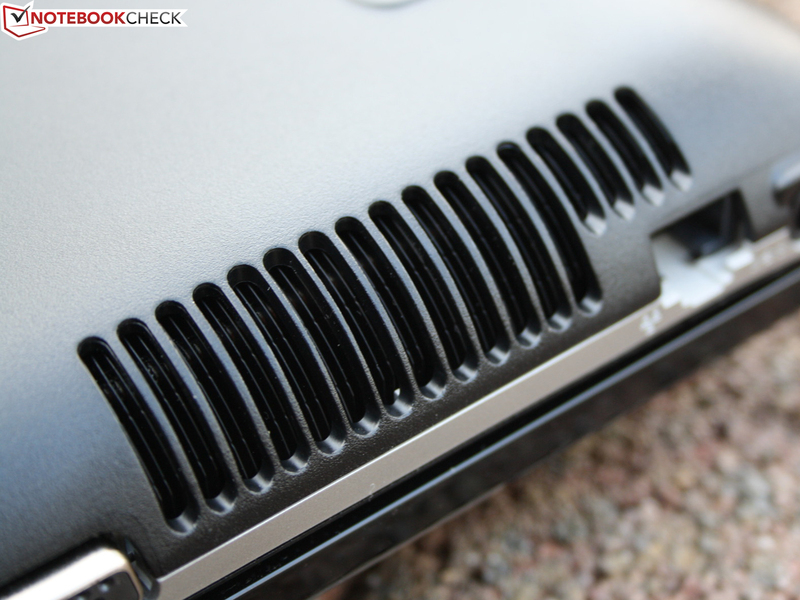 Among others, we used HP's Pavilion g7-1353eg (Dual Graphics) for comparison. It's successor, the g7-1310sg (AMD A4-3305M) works with a Radeon HD 6480G alongside the HD 7450M and costs 500 Euros ($660). Another contender is Acer's Aspire 7750G that starts at EUR 500 ($660) and features a Core i3 alongside the HD 7670M. 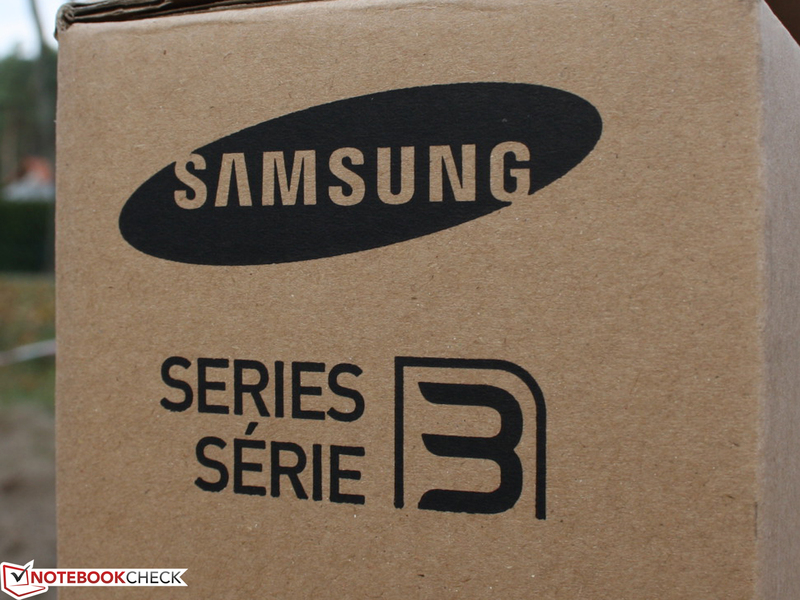 The next iteration from the Series 3 is Samsung's 305E7A (A6-3420M) and is also worth a glance because the Crossfire array of HD 6520G + HD 6470M is also available for below EUR 500. Samsung's entry-range featuring a competitive price and design is the Series 3. Therefore, the partially weak plastic build is unsurprising. Good hardware is expensive and high-end materials also have their price. 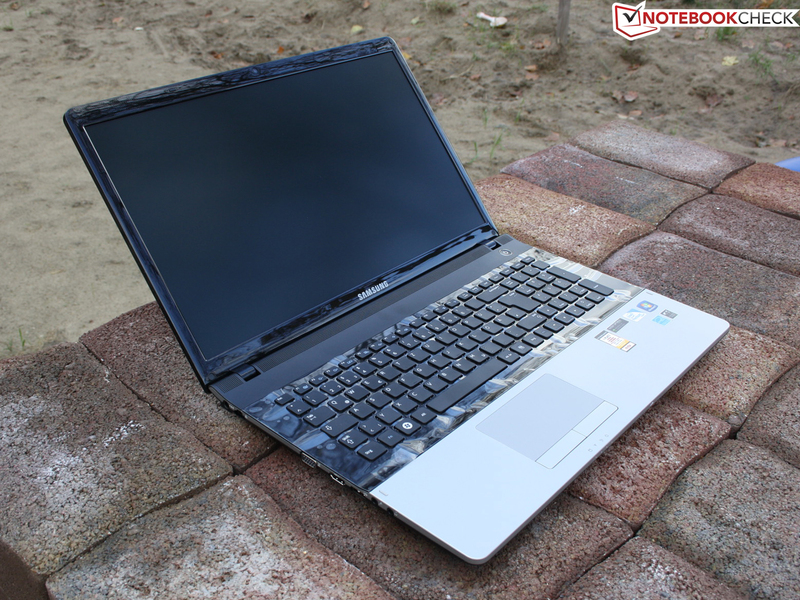 The buyer will consequently have to accept a pliable, bulky and hollow sounding laptop. We noticed how the base unit twisted when we picked it up. The loosely mounted lid warps the base unit when moved and it rocks heavily. 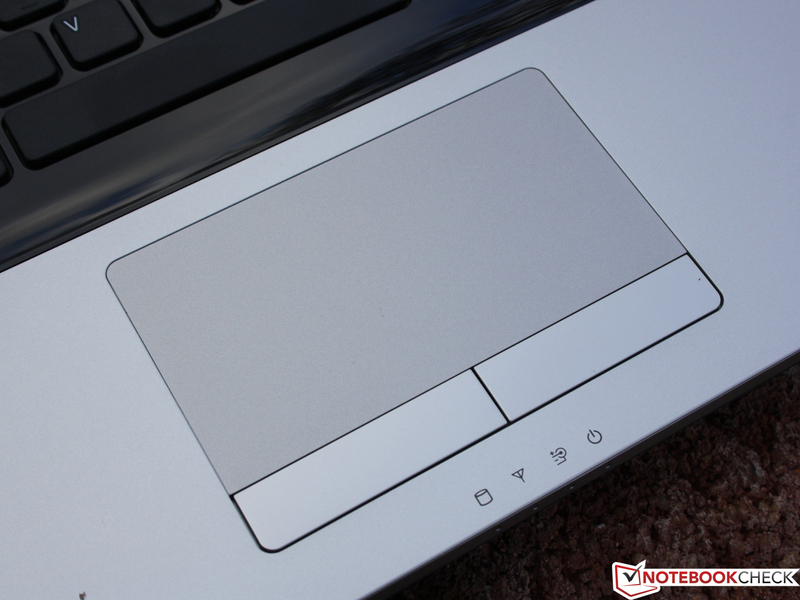 The wrist rest is firm on the right and left, but it deforms visibly in the touchpad's center. 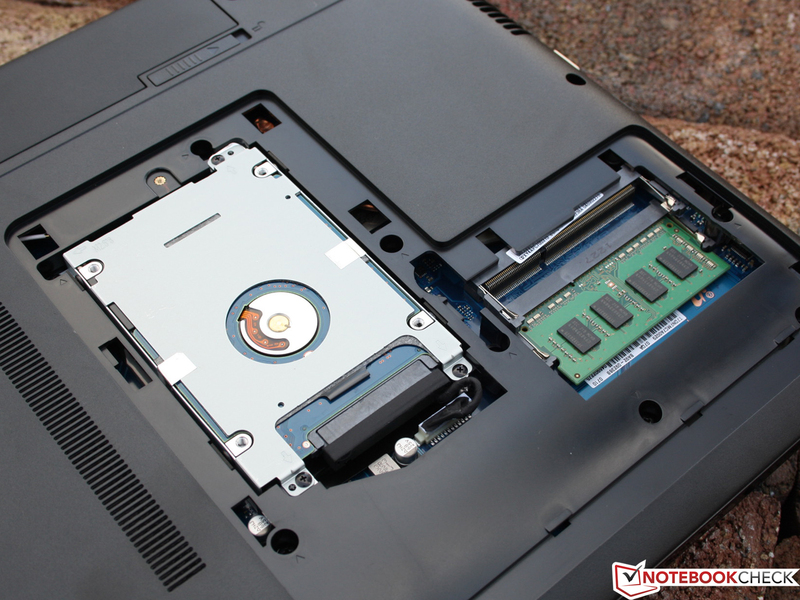 The area beneath and above the DVD drive is very spongy and the user should not lift it up here. A glossy bezel frames the screen. It is dotted in order to crudely hide greasy fingerprints. This regrettably is not so on the key board section. 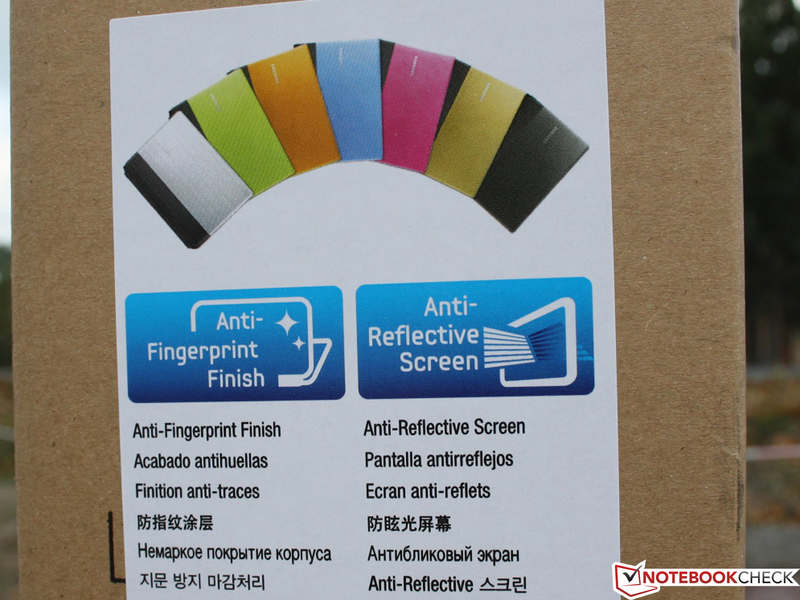 Fingerprints will be a matter of course after removing the protective foil. The lid visibly warps when opened with both hands and without effort. Both hands are needed for opening because the base unit is light at the front. A maintenance cover on the bottom allows accessing the working memory (2 slots, one empty) and hard disk. There is no easy access to the fan for cleaning purposes. The ports are no surprise. USB 3.0 is not installed and the large size also only sports three 2.0 USB ports. 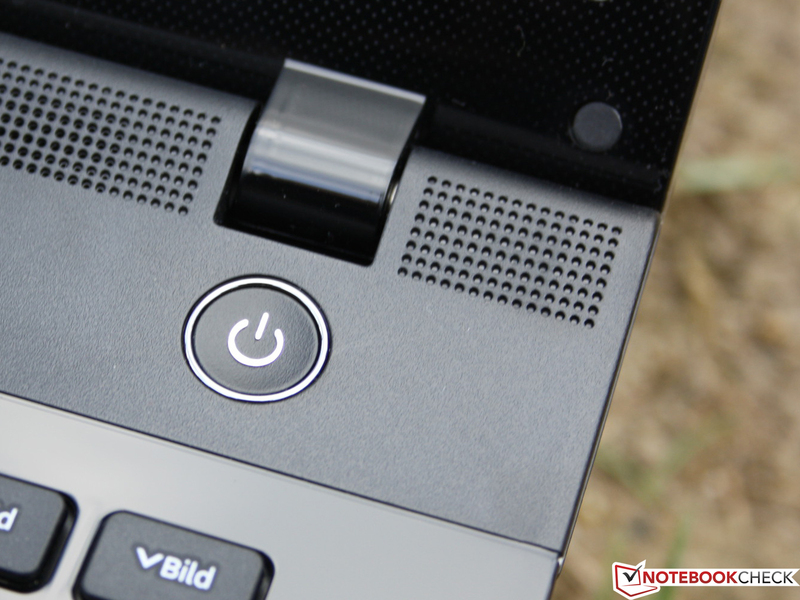 The laptop's rear would be convenient for interfaces when the 300E7A is to be used permanently on the desk. Then all cables would be routed invisibly to the back. However, very few manufacturers spoil their customers with this sensible design element. The Centrino Wireless-N 130 (half-mini card) is one of the cheapest Wi-Fi adapters from Intel. The user has to be satisfied with the 2.4 GHz band and the 802.11 b/g/n standard. The maximum gross transmission speed of 150 Mbit/s lags behind more expensive models. At least it features two antennae for good reception, although only single-stream operation is possible. Bluetooth 4.0 is a part of Intel's module. 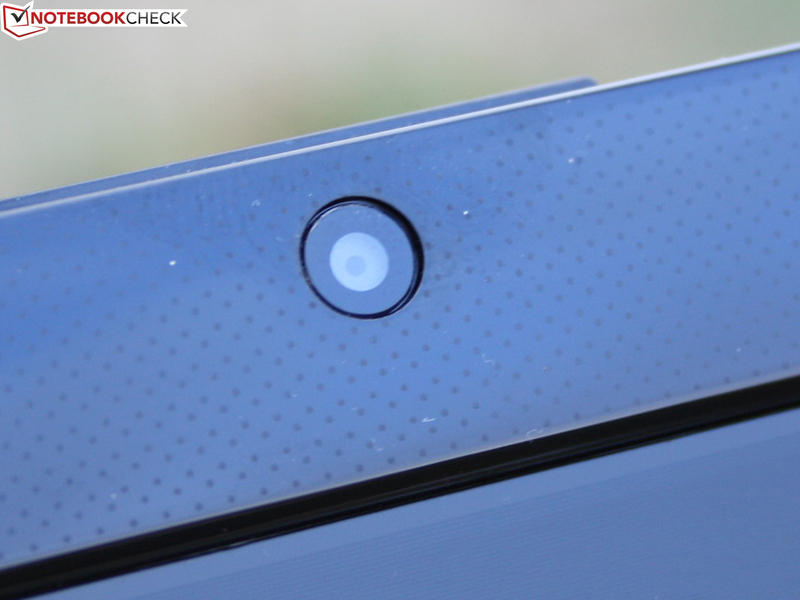 The 0.3 megapixel webcam in the display bezel cannot take poster-sized pictures (640 x 480 pixels only). Cyberlink's YouCam is preinstalled for this purpose. The camera quality is low, even in very good lighting conditions and in daylight. The focus decreases and the noise increases in cloudy conditions or at twilight. 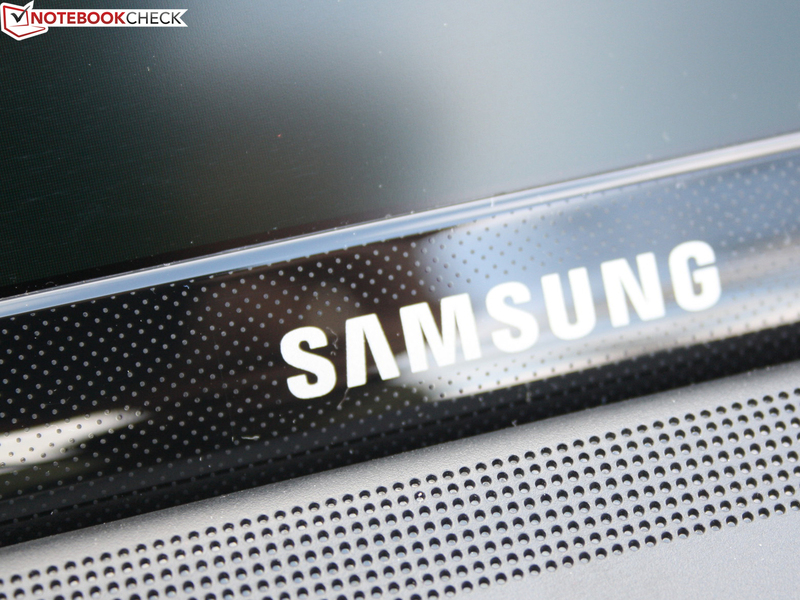 As typical for Samsung, the microphone is in the left wrist rest and the hand covers it when typing. Voice recordings are quite clear and intelligible, but the nearby fan causes background noise. 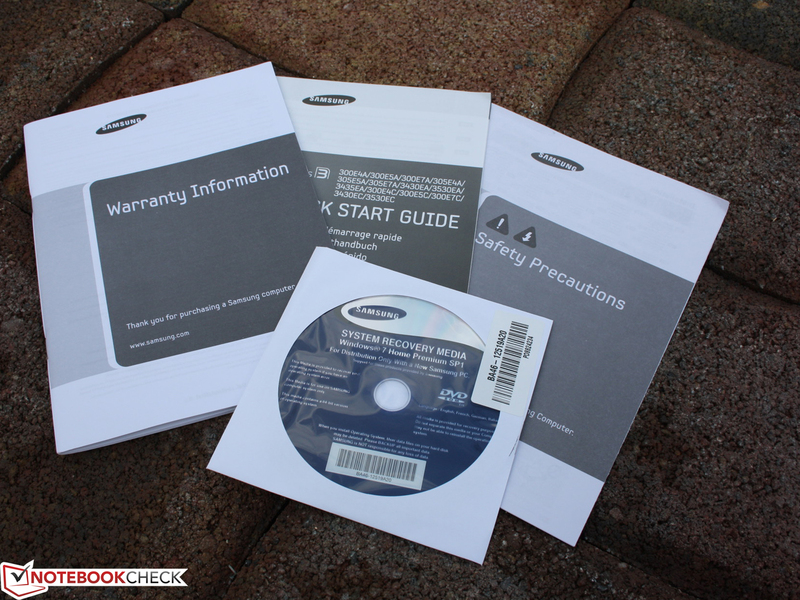 In addition to safety and warranty information, a quick start guide and a recovery DVD for the preinstalled Windows 7 Home Premium 64 bit is in the box. Samsung's Easy Settings tool (system settings and energy management) conveniently bundles a range of functions and tools that spares the user from long-winded searches in the system settings. There are also settings that are manufacturer-specific. Battery Life Extender (80% charge), Fast Start (on/off) or Silent Mode (auto/low, on/off) seem sensible. Samsung installs a trial of Norton's Internet Security, which annoys the user with activation pop-ups. It is possible to access the hard disk and working memory via the maintenance cover. While the 2.5 inch HDD has to be completely replaced for upgrading, the installed 4 GB memory module can easily be complemented by another one. Regrettably, it is not possible to access the fan and thus cannot be cleaned. The entire base would have to be removed for that. Although it is technically possible, it requires a bit of skill. Opening it completely also becomes necessary when the Wi-Fi module's half-mini card or the CMOS battery has to be replaced. The base warranty of 24 months (no on-site; collect & return only) can be upgraded in online shops. An upgrade to a 3 year on-site service costs around 60 Euros ( $80) and about 100 Euros ( $130) is due for a total warranty period of 4 years. The big 17-inch chassis provides enough room for a full-sized keyboard alongside a number pad. The chiclet-style keys are embedded in a recessed glossy tray. The keys' fit is acceptably firm and we did not notice denting anywhere when typing lightly on it. If you have a firmer stroke, you will notice that the number pad dents and recoils. The optical drive is installed beneath it. The layout is good overall and the number pad features the same key size as the other keys. "Plus", "minus" and "enter" are located at the outer right. We find the typing feel for a low-cost laptop compelling. The keys feature a palpable pressure point and a sufficient drop. The stroke is firm, but not hard. The keys do not have a concave surface, which occasionally impairs accuracy. However, this is not a problem due to the large gaps between adjacent keys. The arrow keys should have been moved out of the keyboard area for easier detection (an offset for easy detection). 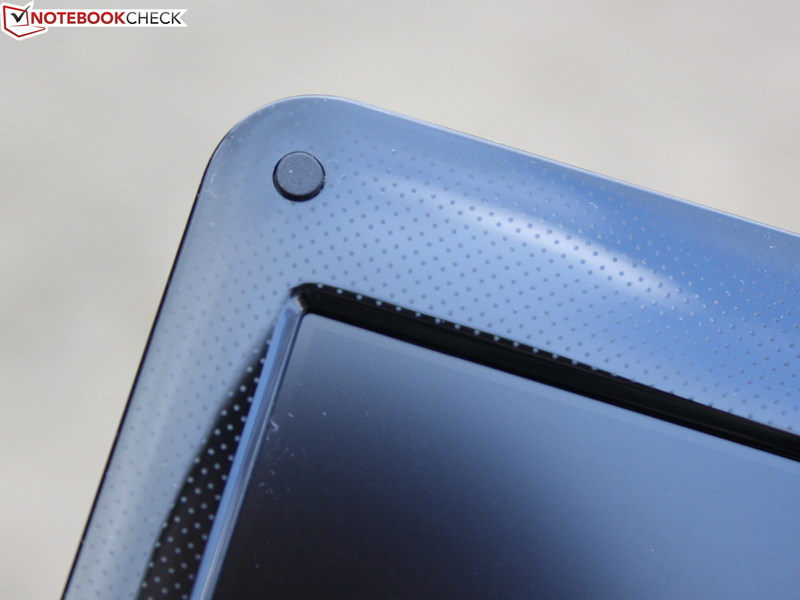 Synaptic's touchpad (v7.5) also made a good impression. Even moist fingers easily glide over the sleek, 10 x 5.5 centimeter pad and navigate the cursor swiftly. Subjectively, the accuracy is above-average. Of course, Synaptic's pad also supports multi-touch gestures. They can be customized to an extent like enabling the three-finger-flick. Both mouse keys produce a loud but annoying (in the long run at least) clicking noise. The pressure point is clear, but the drop is just sufficient. The stroke on the right and left is soft, which increases the clicking speed. The Aspire 7750G and HP Pavilion g7-1353eg feature much inferior inputs due to a shorter key drop and unclear pressure point. As all basic 17-inch laptops, our 300E7A relies on a 1600 x 900 pixels display, which equals a pixel density of 106 dpi. The screen from AUO is AR-coated. The TN screen's contrast of 360:1 pleases with adequately vivid colors. However, it cannot be said to have a high contrast. We examined the reproducible color space although this criterion is only important for a few users like professional graphic designers. As expected, we found a poor AdobeRGB (t) and sRGB (t) coverage. 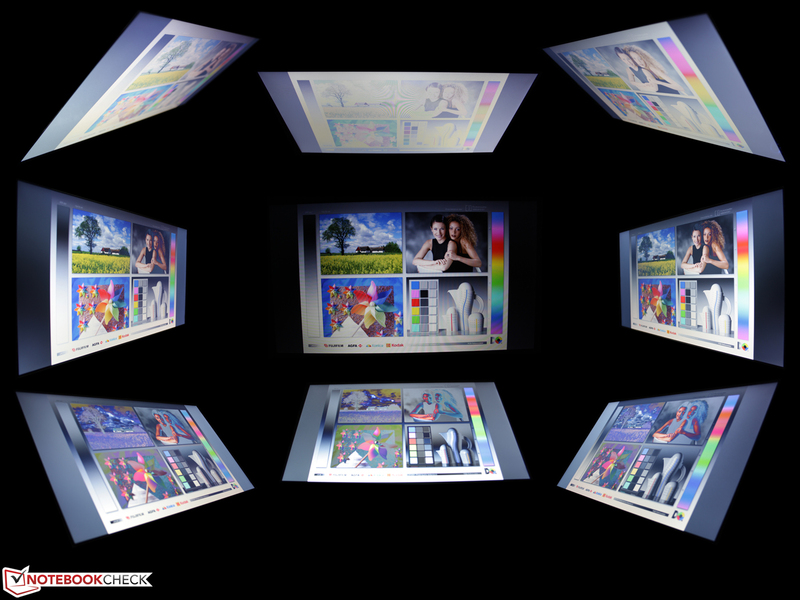 The 17-incher's contrast and color space are worlds apart from a professional screen as in Apple's MBP 15 Retina (t). The white LED backlight distributes the brightness relatively homogeneously with 90% coverage and shines comparatively bright with an average of 272 cd/m² Due to the evenness, the eyes do not detect bright spots. 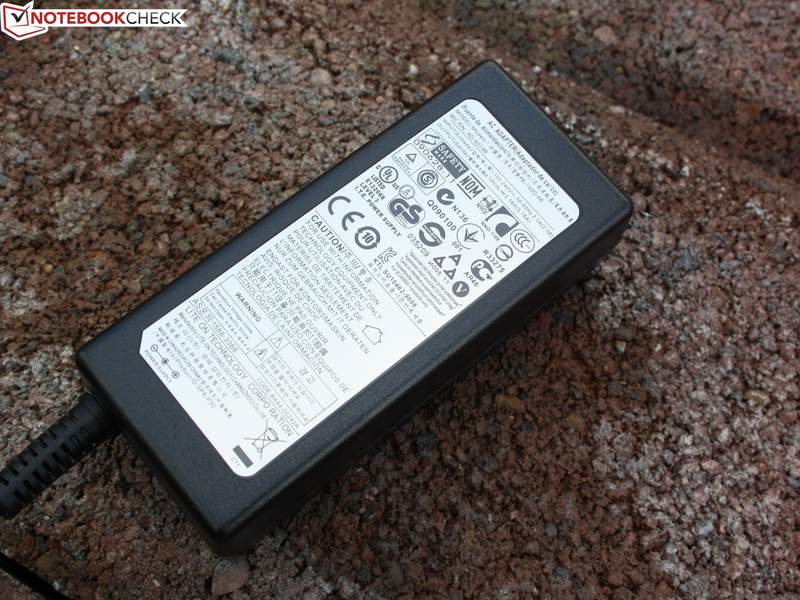 The brightness is maintained on battery power and thus good outdoor results are possible. The luminosity is very good for the low-budget range. Although our three outdoor pictures were taken in overcast conditions, they show a sharp picture. This should also be the case in sunlight owing to the feasible contrasts and high brightness. The viewing angles are far from perfect. 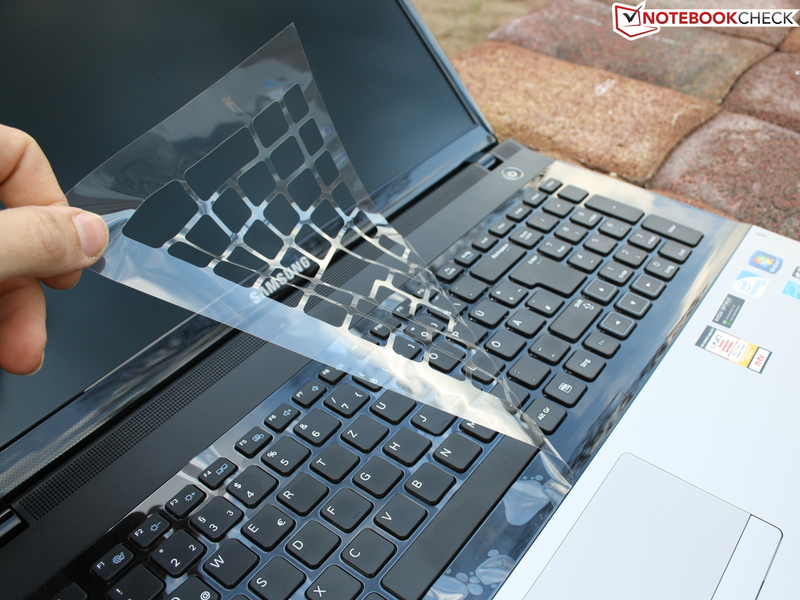 However, the customer has to accept this phenomenon in virtually all low-cost laptops because the screens are always the cheapest TN panels. We could change our view up to 40 degrees from the front horizontally. Beyond that, the content increasingly dims and the colors invert. This effect occurred with the slightest deviation of approximately 10 degrees vertically. The narrow vertical viewing angles are visible on the darkroom picture. We experienced the most intense restrictions looking up or down and from the sides (ghosting). Samsung opted for Intel's low-end Pentium B960 processor for its low-cost model. The 35 W CPU is based on Sandy Bridge (32 nm build) architecture and includes HD Graphics and DDR 3 memory controller. The dual-core is not capable of Hyper Threading or Turbo Boost. The buyer has to decide whether a low-end Pentium is wanted or not. The Series 300E7C is also available with the latest Ivy Bridge technology: From a Core i3-3110M and HD 4000 (450 Euros/$600) up to an i7-3610QM and AMD's Radeon HD 7670M (starting at 700 Euros/$920). The GT 520MX, like in the test device, is only installed in devices featuring Sandy Bridge processors like the Core i5-2430M. All stronger Ivy Bridge models sport the HD 7670M. Nvidia's Optimus automatically switches between the integrated and dedicated graphics, which reduces the power consumption. The configuration options for the 17-incher are vast. Now, we will look at where our low-cost model places itself in terms of performance. For this, we compared it with laptops that also cost less than 500 Euros, but which could feature a different configuration. Samsung's 350V5C-S07DE is in the lead (+271%), which is not surprising in view of the i7-3610QM quad-core. However, it is surprising that the HD 7670M in the 350V5C is not much better (+7%) than our GT 520MX in the OpenGL test. This is unusual as the Satellite L850-153 shows much better performance (+92%). Core i5 systems have a 50 to 70% higher multi-core processing performance. AMD's A10 and A6 quad-cores also defeat the Pentium, although the difference is not a big as with the Intel Cores. The differences in system performance are not as extreme as the performance comparison indicates. 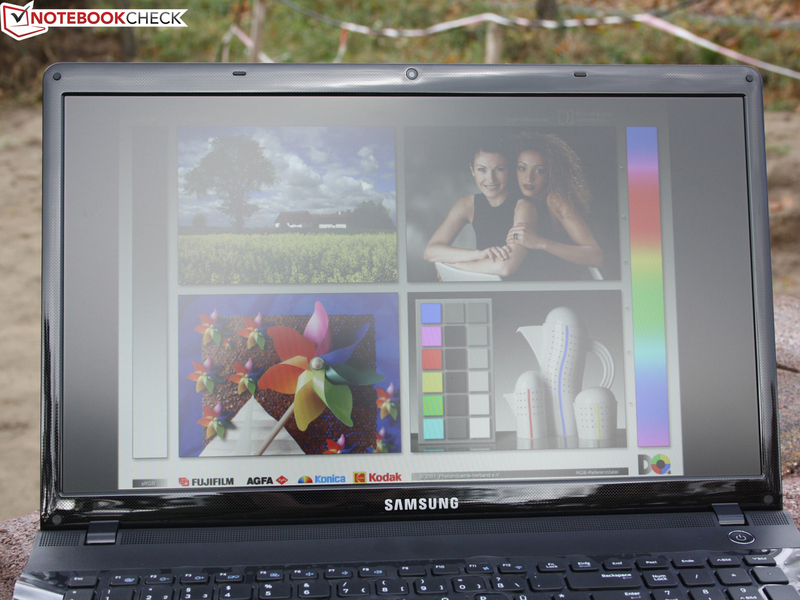 Even Samsung's expensive 350V5C (HD 7670M) quad-core laptop only has a 38% advantage in PCMark 7. Toshiba's L850 (i5) follows with about a 28% gain. Sony's Vaio SV-E1712F1EW, also equipped with a Pentium (B980) manages a slight advantage of 17% with its Radeon HD 7650M. Samsung's 305E7A-S03DE (AMD A6), which was in the lead in processing performance, now falls behind the test laptop by 6%. First impressions can be deceiving. We looked at the graphics-intensive entertainment sub-score and found the three HD 7670M laptops in the lead. Even the Vaio SV-E17 with its Pentium is among them. The 500 GB hard disk from Hitachi spins with a below-average speed. It is the reason for the low HDD scores (PCM7 / PCM Vantage). The HDD sub-score is 1580 and 3385 points respectively. The hard disk spins at 5400 rpm. It records a speed of 58 MB/s in sequential read (HDTune). CrystalDiskMark finishes with 62 MB/s (different test routine), which is a poor read rate even for a slow-spinning 5400 rpm HDD. The competition (with no SSD) is at least a bit faster. Lenovo's Z585 manages to achieve 110 MB/s (+78%) for the same drive speed. Nvidia's GT 520MX is a rather unusual entry-level graphics card. It is a revved up GT 520M that has an increased core frequency (900 rather than 740 MHz) and memory frequency (1800 rather than 1480). Details about the graphics card can be found on the GPU page. 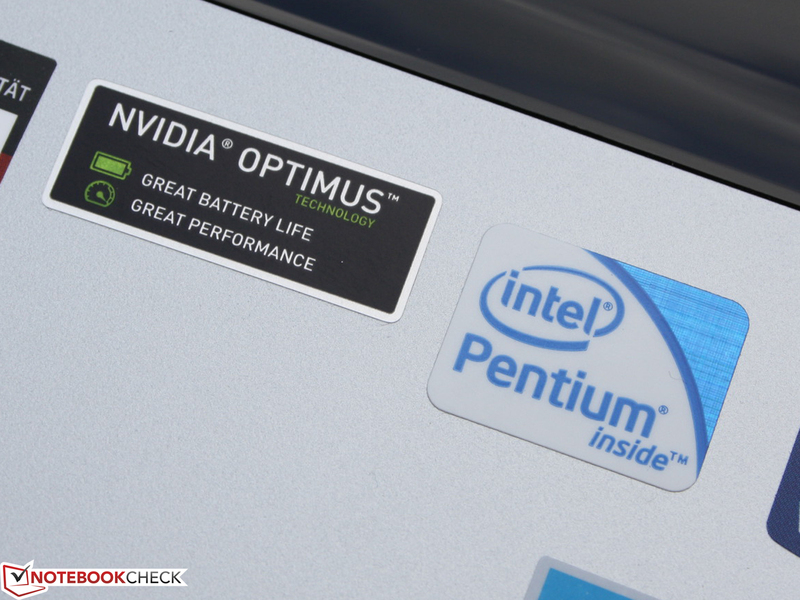 The resulting higher TDP does not harm the battery life because Nvidia's Optimus automatically disables the GT 520MX when applications or games do not need it. Our 3D benchmarks and games all immediately ran without problems on Nvidia's GPU. It was just the Deus EX and Medal of Honor: Warfighter games that consistently crashed when started. 3DMark 11 (p 658) finished just as poor as the CPU-dependent, older 3DMark 06 (5235). That is an extremely low score compared with the latest mainstream GPUs, such as Nvidia's GeForce GT 650M (at least 12500 points, 3DM06) or GT 630M (8000 points). The HD 4000 in a 35 W Core i5 is only 10% slower (see ThinkPad L430). The question whether a corresponding laptop with Intel's integrated GPU would perform just as well arises and the gaming tests can answer this. The GeForce GT 520MX exhibits disappointing results in gaming. This is not necessarily due to the Pentium, as Samsung's 300E5A (Core i5) and the same GPU proves (Anno 2070, Skyrim). 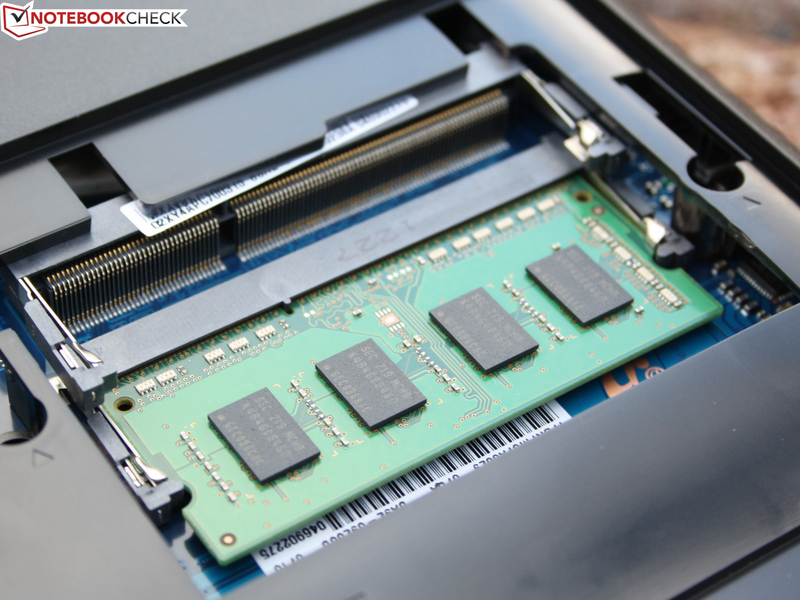 Intel's HD 4000 (Nexoc B510, LifeBook E782, One M73-2N) is either on par or accomplishes even more frames than the GT 520MX. So, if you want the same (poor) gameplay, you might as well take a Core i5 + HD 4000 solution. Games are generally, if at all, only playable in low details and resolutions. We added a range of up-to-date 2012 games to the test course to confirm the surprisingly low result. Only undemanding games, like Counter Strike: GO or Fifa 13, run smoothly at HD resolution. Consequently, gameplay at the native 1600 x 900 pixels is not possible. The HD 7670M devices are definitely much better gaming machines, even with the weak CPU equipment (Vaio SV-E1712F1EW, Pentium). AMD's dual-graphics solutions are roughly just as reasonably priced (IdeaPad Z585), but the initial exultation can quickly turn into frustration depending on how often the games are changed. The reason for this is the unsatisfactory driver implementation of the dual-graphics technology. 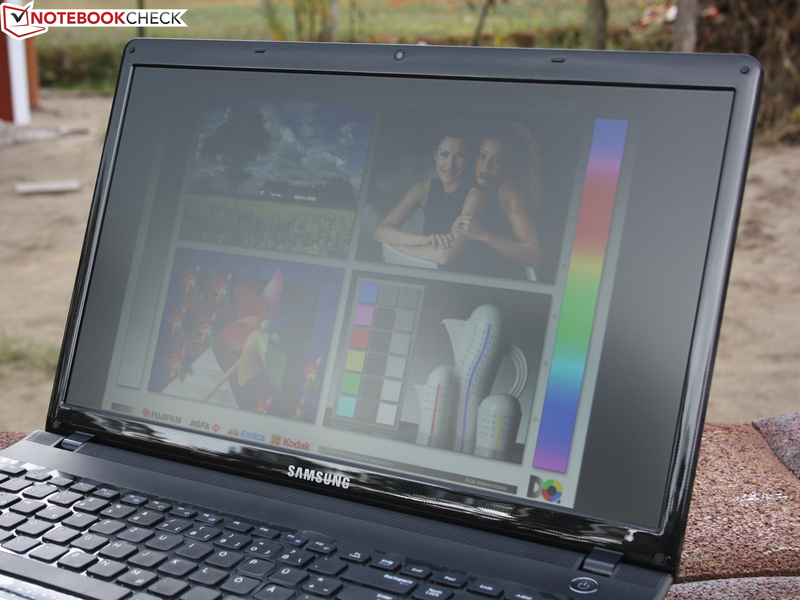 Quiet laptops are a hallmark of Samsung. Its Silent Mode button is almost legendary. Ultrabooks do not feature this function, but it is still incorporated in standard laptops. The fan permanently spins at lowest speed or is disabled for long periods during load (low waste heat). Then, only the hard disk's buzzing is audible. The noiselessness of Silent Mode is at the expense of reduced performance. The CPU's clock was limited to 800 MHz even in load conditions. We measured the idle temperature in this mode. The waste heat accumulated in the chassis because of the disabled fan and heated it up to 40 degrees Centigrade. The fan spins consistently at its lowest speed (Silent Mode off) during basic Office tasks, such as Word, Excel, mail or Web browsing (a lot of idle). First, permanent load lets the fan turn up audibly. The noise increased to 41 dB (A). This is equally true for both medium load (3DMark 06) and the stress test (CPU + GPU). Silent Mode reduces the volume to 34 and 36 dB (A) respectively in these load scenarios (throttling performance). But either way, the consistent noise is tolerable and the fan management works sedately. The waste heat only increased the temperatures up to 49 to 52 degrees Celsius in the hot spots during constant load induced by the stress test (Prime95 + Furmark). The user notices this when the laptop is picked up in the fan's area. We did not observe CPU throttling during the tests. Apart from Silent Mode, the Pentium clocked at 2.2 GHz regardless of whether it was single or dual-core load. The 300E7A maintained the high performance on battery power (graphics + CPU performance). (-) The maximum temperature on the upper side is 48.6 °C / 119 F, compared to the average of 36.5 °C / 98 F, ranging from 21.1 to 71 °C for the class Multimedia. The two speakers above the keys overemphasize the trebles and mids and low ranges are neglected (which is unbalanced). We hear a clear scratching sound and distortion from the small speakers at high volumes. The volume is quite high and adequate for a 17-inch laptop. The installed speakers will not satisfy music fans. Thus, external speakers are a must. The audio presets make the most sense with quality headphones (SoundAlive). The long idle period (minimum load and brightness) indicates low power consumption. The measurements confirm this, particularly in idle. The lowest idle power consumption ranges between a mere 9 W to a maximum of just 14 W. But that is nothing special since all 15 and 17-inch test devices with the latest Intel processors consume approximately 10 to 15 W, with the exception of Intel quad-core systems. The 300E7A scores a bonus point for energy management due to Nvidia's Optimus technology. It shuts off the GT 520MX when it is not needed. Then, only the energy-efficient, but low-performance Intel HD Graphics (Sandy Bridge) integrated in the Pentium processor is active. The power consumption climbed considerably to 64 W during the stress test (Prime95 + Furmark). The small 60 W PSU (349 grams including the cord) seems to be slightly overtaxed by such a situation. However, 52 degrees Celsius on the power adapter during full load is not alarming, particularly since our stress test is an unrealistic power scenario. The effective power in 3DMark 06 was 61 W.
The 6 cell lithium ion battery (48 Wh) ensures viable runtimes. 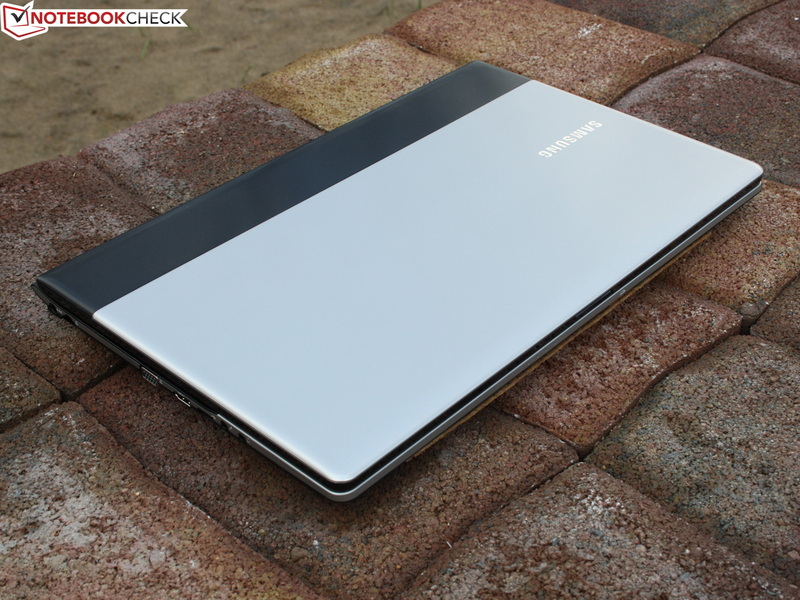 Samsung's 17-inch laptop lasted for 3 hours 27 minutes while surfing with Wi-Fi. It is possible to watch a DVD movie for about 2 hours 55 minutes on the go. Undemanding users can boost the idle runtime up to 6 hours 39 minutes (Reader's test). However, that is not a realistic time since it is impossible to work without real processor load, disabled Wi-Fi and at minimum brightness. The small 60 W PSU needs 2 hours 9 minutes to recharge the battery. 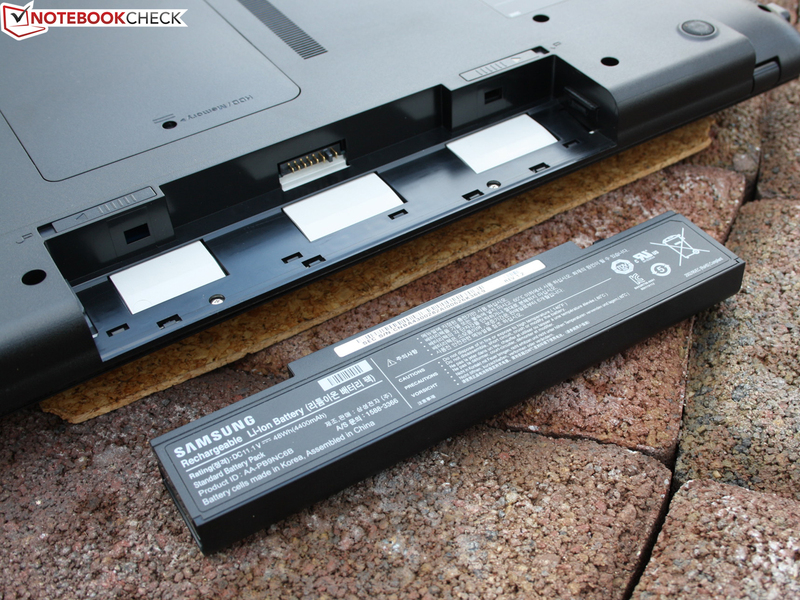 For comparison, the stronger Samsung Series 3 350V5C (3610QM, HD 7670M) lasts for 4:19 h (49 Wh). 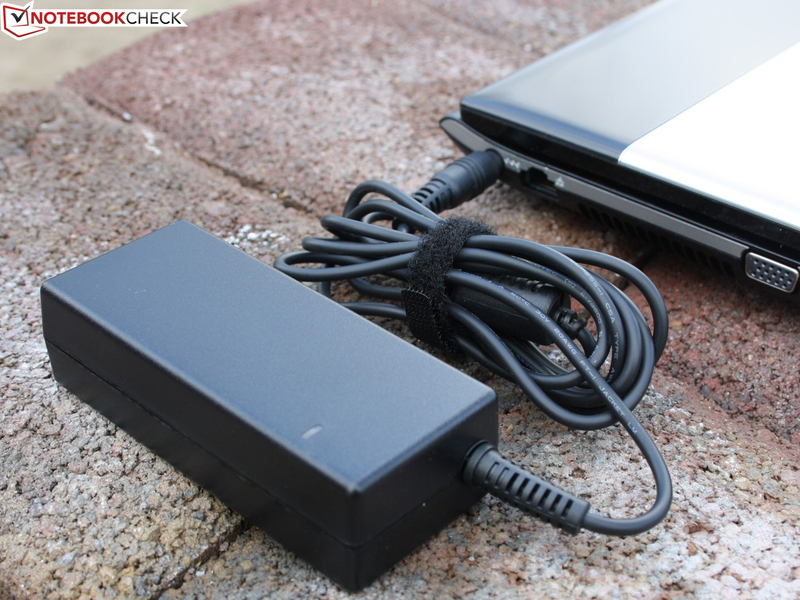 The Vaio SV-E1712F1EW (Pentium, HD 7670M) only manages 2:36 hours (44 Wh). Fujitsu's 17 inch LifeBook E782 runs for 4:38 hours without a dedicated graphics card, but in this case, the battery has a capacity of 63 Wh. Samsung's Series 3 300E7A-S09DE aims at the highly competitive, ultra-low-cost 17-inch market category. It's special feature is the GeForce GT 520MX. However, the gaming results are disappointing. 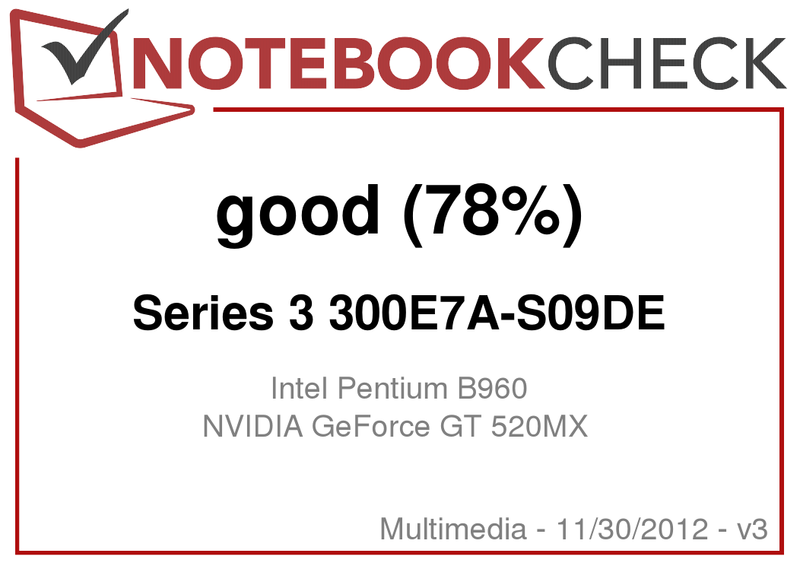 It is not the fault of the weak Pentium B960, but rather due to the GT 520MX's low performance. One particularly discouraging insight is that Intel's HD Graphics 4000 integrated in a Core i5 which renders just as fast if not faster than Nvidia's dedicated graphics card. GPUs like the HD 7670M run games much better even when the processor comes from AMD (like the A6). Correspondingly, the laptop alternatives are only slightly more expensive (at least for 15-inch machines). The matte screen, low system noise (Silent Mode) and the good battery life of 3:27 hours are the 17-inch laptop's best assets. The input devices are acceptable although prolific writers will want a quieter keyboard and a clearer pressure point. 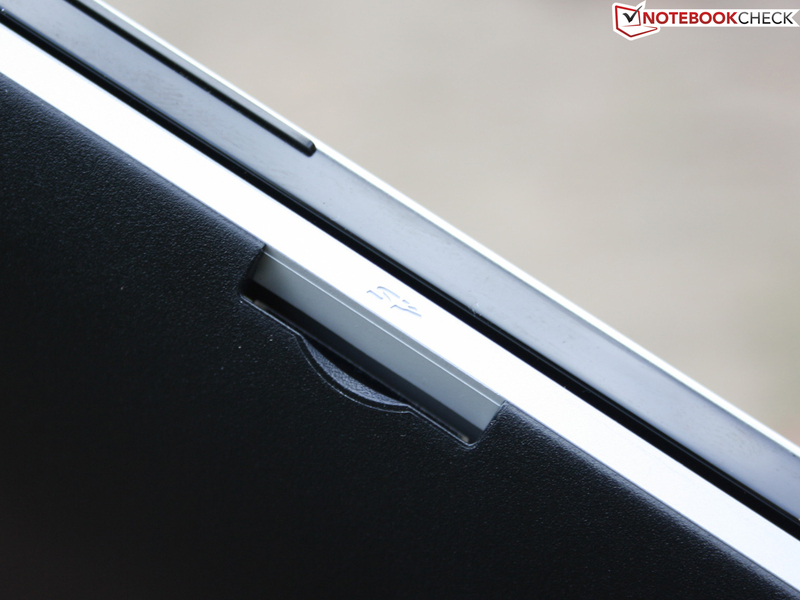 Besides the unstable construction of the lid, the hinges and base unit, the limited amount of ports, the poor maintainability and glossy keyboard bezel are the other drawbacks that cannot be overlooked easily. This can be excused in view of the laptop's low price of a mere 399 Euros (depending on configuration, machines with Free DOS possibly sold out). However, these points weigh even heavier considering the disappointment when it comes to gaming. Those looking for a fairly gaming-suitable device in the EUR 450 price range will have a hard time due to the innumerable configuration options. This also applies to us testers. Although we have reviewed most alternative models, they are not in a similar low-cost configuration, e.g. with a Core i3 or Pentium. Buyers with gaming ambitions (17 inch) who do not want to invest more than EUR 500 should look around for a HD 7670M accompanied by Intel's Core i3 (e.g. Acer's Aspire 7750G, i3 2310M). Virtually nothing can go wrong for entry-level gaming. AMD's Dual Graphics (e.g. 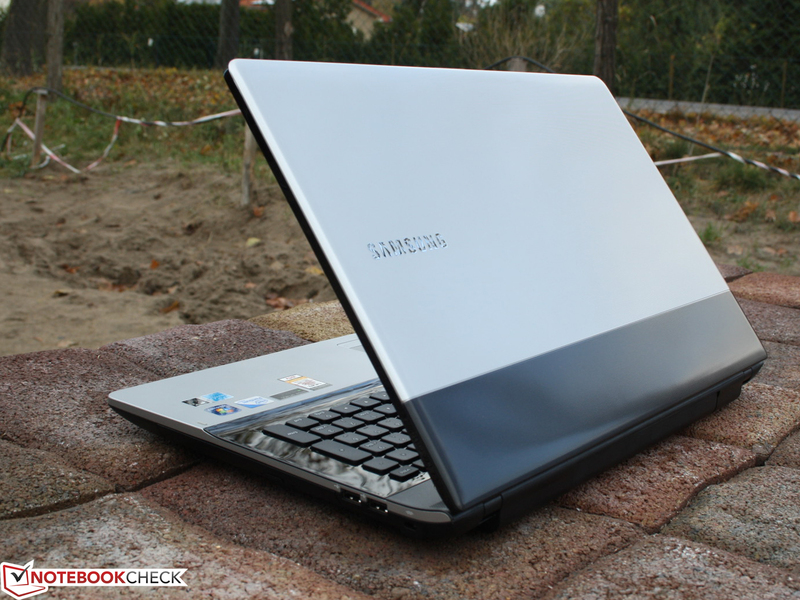 HP's Pavilion g7-1310sg, Samsung's 305E7A) is affordable, but not always swift. The performance fails in some games due to the poor driver support. Here, the buyer should favor a single GPU solution if stress prevention has top priority. 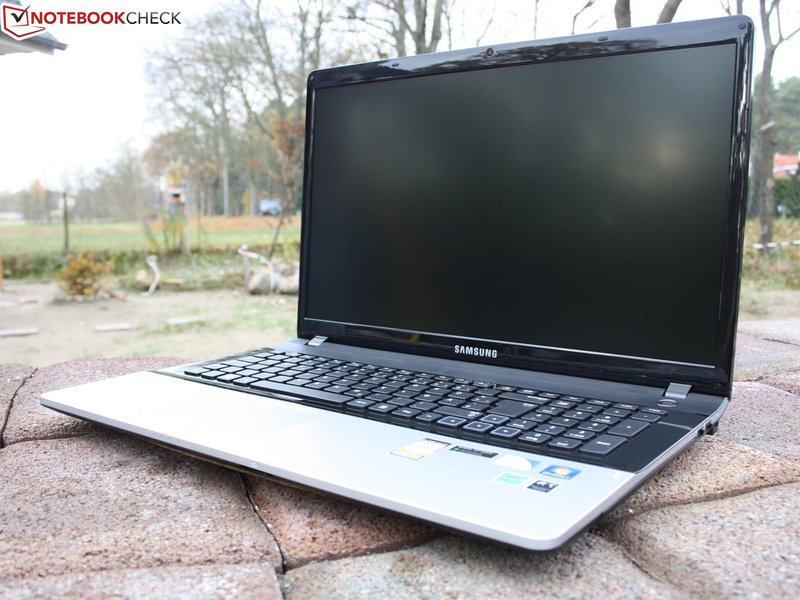 Samsung NP300E7A (NP-300E7A-S09DE): It is not the Pentium processor that curtails the gaming ability of the notebook but the low performance (and redundant compared to the IGPs of today's processors) GeForce GT 520MX. and looks a bit misplaced. Why hasn't it found room on one of the side? 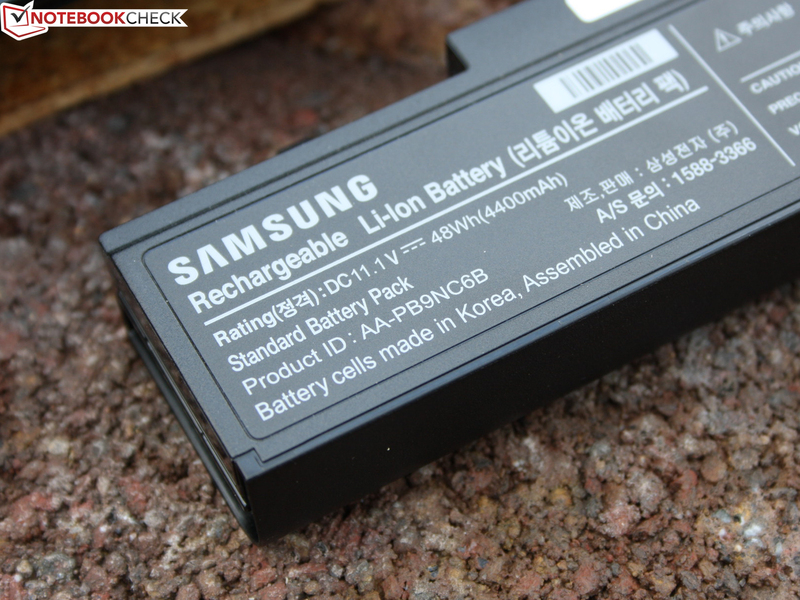 The battery has a capacity of 48 watt-hours. That is still enough for a good three hours of mobility (Wi-Fi test) at medium brightness. The 4 GB RAM module can be complemented by another, which also represents the maximum capacity. The small PSU supplies 60 watts (349 gram including the cord). It is already loaded past maximum capacity in the 3DMark 2006 test(61 watts). 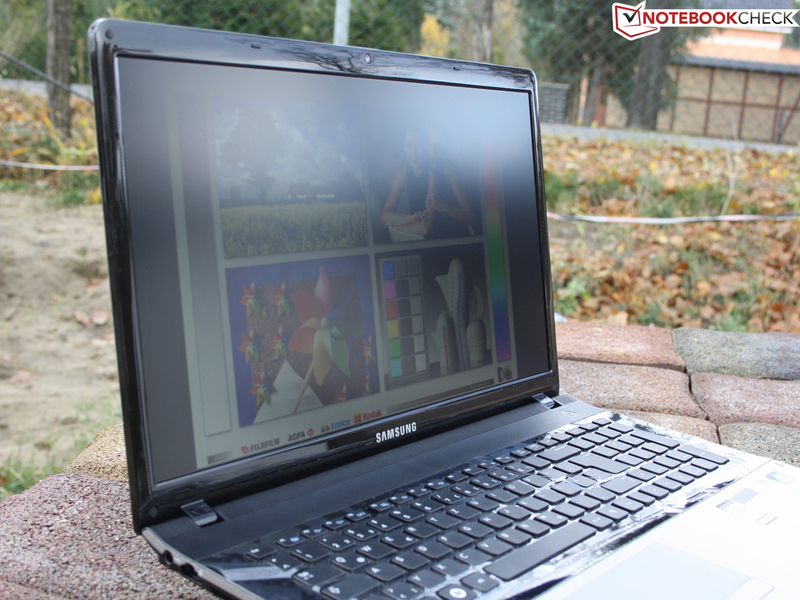 Samsung's NP300E7A: Matte and always bright - the desired screen criteria (for outdoor use) are fulfilled. 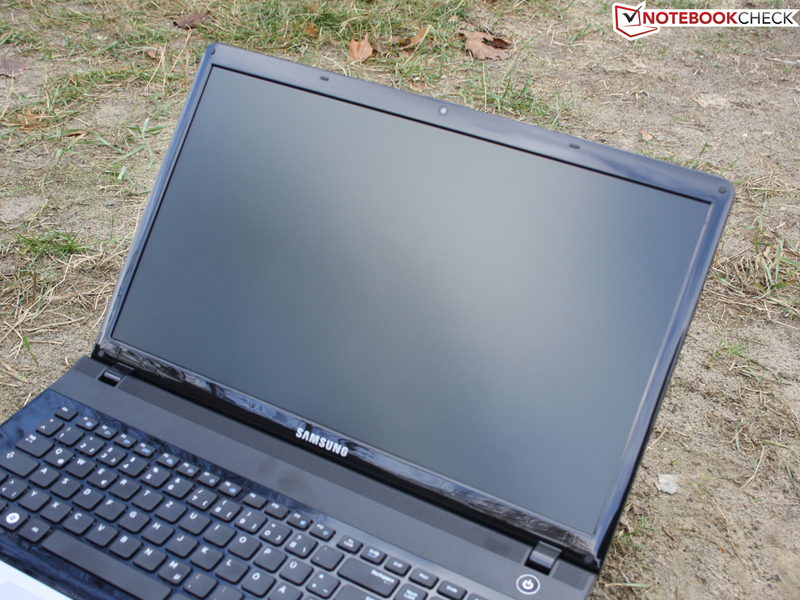 Samsung's NP300E7A: The chassis is only low-quality. Samsung's NP300E7A: The GeForce GT 520MX's gaming performance is disappointing. 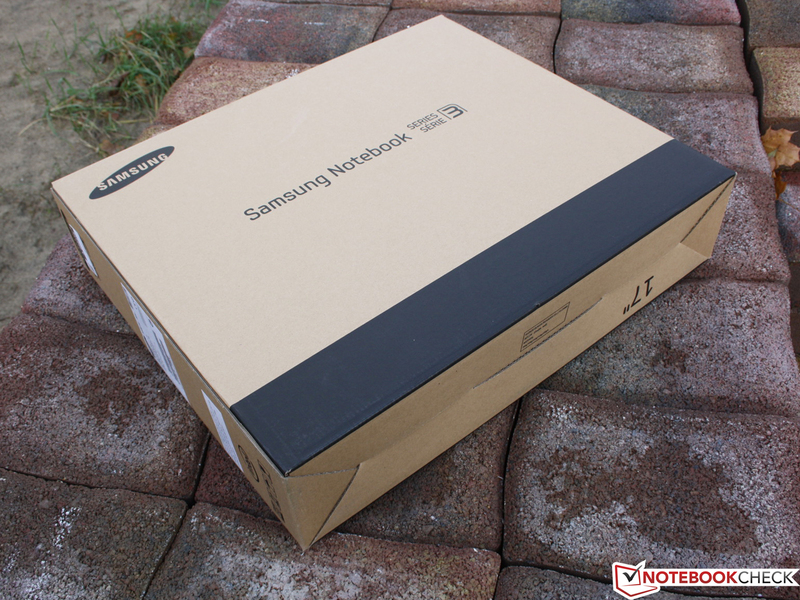 Samsung's NP300E7A: And is noth the fault of the Pentium processor. 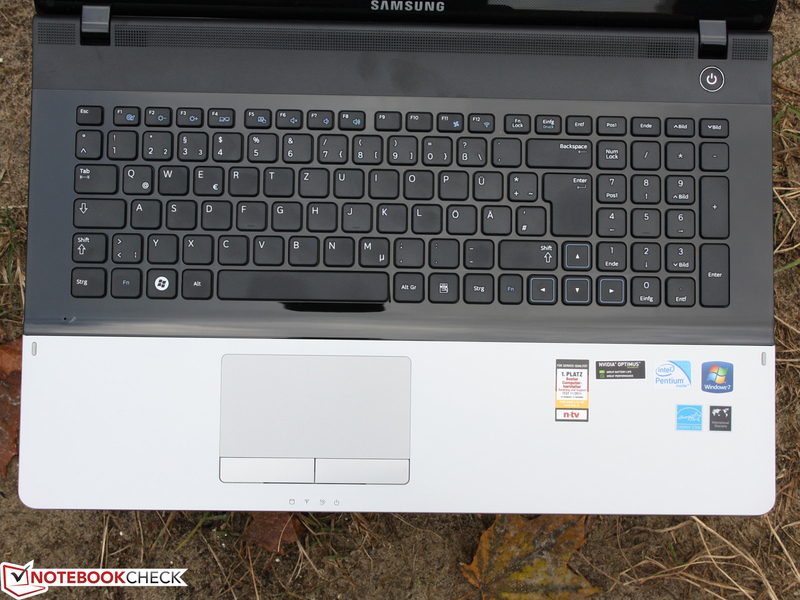 Samsung's NP300E7A: Typing is a little noisy, with the keys framed with glossy plastic. But at least VGA and HDMI as well as two dedicated audio jacks are installed. Standard fare in connectivity: USB 3.0 is not available. The glossy bezel has a textured surface which reduces fingerprints. offer such components for prices considerably below 500 Euros. 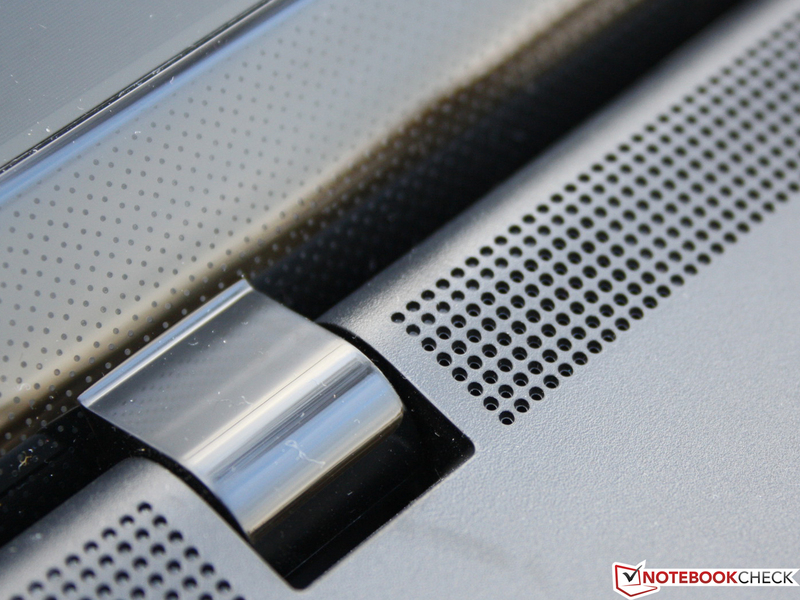 The 17.3-incher is a plain laptop without aluminum bells and whistles. are somewhere between pseudo-stylish and suitable for everyday use. The matte WXGA++ screen is definitely a positive attribute of the 300E7A. Particularly, the brightness is impressive in the low-cost price range. with an Nvidia GeForce GT 520MX. This type of combination with a weak Pentium CPU is extremely rare. The casing is not rigid. The lid and base unit creak and warp. The ideal place is the local desk with only few chances for mobility. The webcam only shoots pictures in VGA resolution (640 x 480). 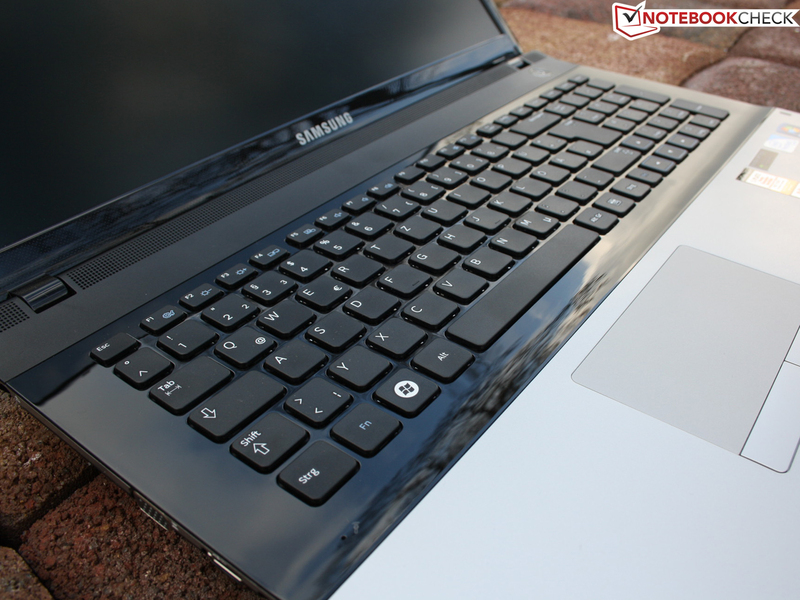 Samsung's NP300E7A: The keys are firmly inserted up to the optical drive. The HD 7670M is better suited for customers with gaming ambitions. USB 3.0 is unfortunately not installed. Nvidia's graphics implies gaming power, but is outperformed by the HD 4000. The Pentium is not the limiting factor.